Scones are the quintessential British teatime treat whether as part of an Afternoon Tea or simply with a cup of tea or coffee. The beauty of scones is the basic recipe being one which can be enhanced over and over, taking the sweet scone to savory with the addition of cheese, adding various dried fruits (Cranberries are a current favorite) or scented as this Lavender Scones recipe with a tiny pinch of culinary lavender. 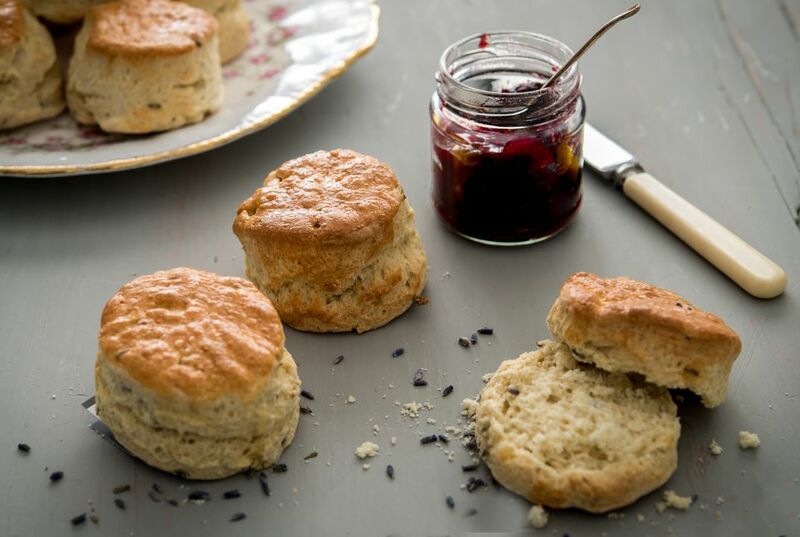 Lavender turns a simple scone, slice of shortbread or biscuit into a summery delight, but approach with caution, add too much and you will swamp whatever you are making with the heavy scent which can be overpowering; less is always more. Start by chilling a large mixing bowl in the freezer for 10 minutes or 30 in the fridge. Sieve the flour and baking powder together into the large mixing bowl. Add the butter and rub into the flour working as quickly until the mixture resembles breadcrumbs, do this as fast as possible, so the mixture does not become warm. Add the caster sugar and the lavender, stir with a metal spoon. Reserve 2 tablespoons of egg (for glazing) then add to the mixture with 3/4 of the milk. Using a dinner knife (not your hands) mix to create a soft, dough - if the dough feels dry add a little more milk but take care not to make the dough too sticky. Tip the dough onto a lightly floured surface and knead gently and lightly to help smoothen taking care not to be too heavy or knead too long. Roll - again carefully – into a circle at least 2 cm deep. Dip a 6cm cutter into your bag of flour and cut out the scones avoiding twisting the cutter (this can prevent the scones from rising). Reform the dough trimmings into a ball and repeat as above until you have used it all up. Place close together but not touching on a lightly greased baking sheet and brush the tops with the beaten egg. Bake in the center of the preheated oven for approximately 10 - 12 minutes or until golden and risen. Check the base of the scones to make sure it also is golden. Keep your hands and all equipment as cold as possible. Work quickly, so the mixture does not get too warm. Used a plain cutter rather than fluted for as it is easier to cut the soft mixture. Never twist the cutter. Keep the scones close to each other on the baking tray but not touching so as they rise and swell, being close will help to keep the sides straight and prevent them toppling over (though if they do they look quite charming and taste just as good).